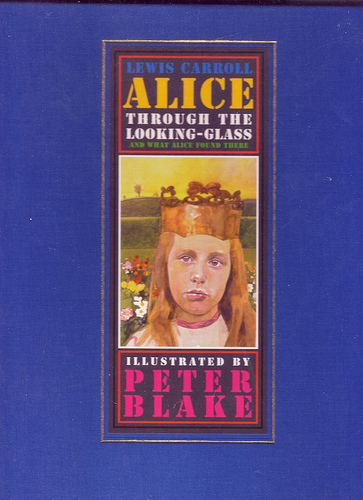 Alice Through the Looking Glass illustrated by Sir Peter Blake. Signed and numbered limited edition of 500 copies: this is number 406/500. Peter Blake is one of the leading figures of British pop art, and is probably best known for designing the Sgt. Pepper’s Lonely Hearts Club Band album cover for the Beatles. 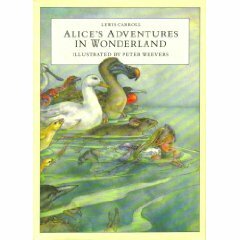 Blake was originally commissioned to illustrate the Alice books back in 1969, but the cost of producing the books was considered too high, so the eight watercolours were issued as limited edition screen prints in 1970. Years later, this limited edition was produced, including all eight. There are also photos taken by Blake of the models he used: both human and of the landscape, with explanations of how the pictures were made. 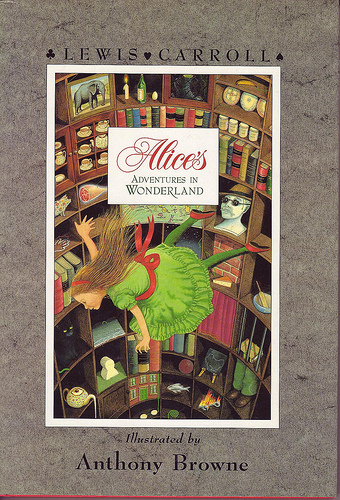 Alice’s Adventures in Wonderland, illustrated by Anthony Browne. Published by Julia MacRae Books, a division of Walker Books, 1988. Hardback first edition with dust-jacket. There are plenty of slightly surreal colour illustrations throughout in text and full page. I like the fact that they don’t follow the Tenniel’s too closely. I bought this for my father: he was an Alice fan too. In fact, all this is probably his fault.